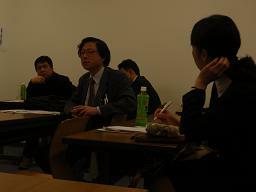 A one-day workshop on economic education mainly for middle school teachers, organized by Network for Economic Education and sponsored by Keizai Kiho Center and Chiyoda-ku Kyoiku Iinkai, was held at Nihon University in Tokyo on March 14, 2009. There were about 20 participants, including not only middle school but also high school teachers, university professors, publishers, businesspersons, etc. 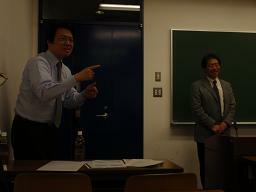 After an opening address by Mr. Akira Arai (Tokyo Nishi High), Mr. Shoichi Shinohara (Doshisha Univ.) gave a keynote lecture on "Understanding Economic Mechanism, " where he emphasized "division of labor" and "exchange" as the basics of the economy, and the importance of the "firm" to understand the mechanism of production and its relation with the rest of the economy including employement, labor, consumption, finance and government. Next, Mr. Toshita Saegusa (Meguro Chuo Middle School) presented a teching material to help understnd the relationship between the firm and the economy as a whole, based on Mr. Shinohara's argument. 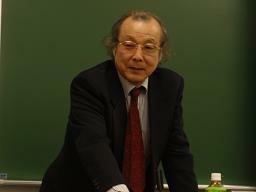 Mr. Saegusa suggested that after a two-hour exercise of the "Beef Rice Bowl Simulation" is conducted and reviewed, a new simulation "How to Expand Beef Rice Bowl Shop" should be tried to help pupils understand the mechanism of the firm further and its relations with the economy and society at large. If time permits, the next step might be to simulate "New Business Start-up" with the help of outside guests from the business world. Finally, a simulation exercise regarding the relationship between the firm and consumer/government would be desirable, if possible. 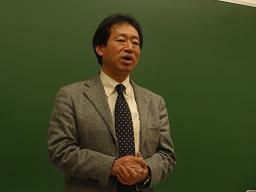 A free discussion among the participants on the above presentations was conducted by moderater, Mr. Issei Kato (Nihon Univ.) for about an hour. 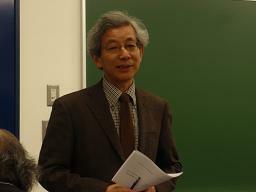 There were various comments and arguments, including the basic viewpoint such as "efficiency" and "equity" to evaluate the mechanism of the firm as well as the economy as a whole, in relation with Mr. Shinohara's presentation, and the limitations and possible modifications of the simple "Beef Rice Bowl Simulation" such as the employment factor, in relation with Mr. Saegusa's presentation. Toward the end, a participant from the business world raised a fundamental question about the traditional economic approach that was emphasized at this workshop, and suggested that a brand new approach should be considered to address the issues of the current financial crisis and basic value changes in the global economy. As a result, the discussion was carried over to the networking party after the workship. Overall, the main theme might have been a little too much to deal with at a one-day (one-afternoon) workship, but all the participants could clearly understand the purpose, meanings and remaining problems with this important theme. In this sense, the workshop was a success as a first step toward further activities along this line in the future.